Every business owner needs to be effective at speaking in and about their business. 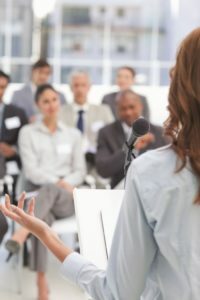 Maybe your business is gaining visibility, you’re speaking to promote your book, or you want your ideas to be heard and recognized in a meeting. Maybe it’s about being more effective in a sales conversation. Or you’ve laid out your business blueprint and identified speaking as one of the ways to grow your business (Go girl! It works, and fast!). 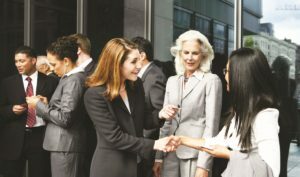 However it is you’re presenting yourself, you want be a polished speaker and come across as strong as you can. The secret is, it’s actually not “polish” that creates impact, credibility, or makes a lasting impression. 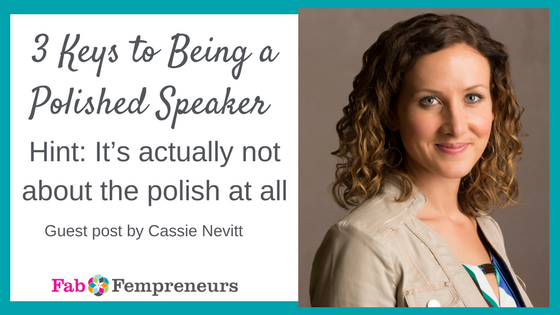 Perfectly polished speakers can come across as hard to relate to, canned, inauthentic, or “above” their audience. The people who stand out and are really seen, heard, and taken seriously, are people with presence. When you have presence, you’re fully yourself, credible and relatable, and people hang on your every word (so nothing gets lost). You are powerful without intimidating or diminishing others. And that allows you to make the impact – and income – you want. The great news? Presence is something you can work at and develop. There are 2 key facets of presence – inner and outer. Inner presence is the feeling solid, managing your nerves, and functioning at a high level under pressure. It is being fully, 100% present and in the moment with your audience. Outer presence is an effortless confidence that attracts positive attention. It’s magnetic. Think of someone that walks into a room with a lot of presence – you’re drawn to them without even hearing them speak. Whether you’re talking to a single person or a sold out crowd, your presence shapes how they take in your content and decide how competent and trustworthy you are. How do I develop presence? There are 44 practices in the body of work specifically devoted to this, the Art of Feminine Presence©. Here are the three essential keys you can do right away to make a big impact. 1) Center and get grounded in your body. Why it matters: Your audience is uncomfortable when you are. Fidgeting, being guarded, apologizing for nerves (verbally or not) – all communicate your discomfort. Being “in your body” takes care of a thousand little detail “fixes” for being a more polished speaker. You become comfortable in your skin. Your words connect with your audience, paint a picture, and make them feel something. It’s a striking difference from being self-conscious or “in your head”. How to do it: Close your eyes and flow your attention to the center point of your body – 3 inches below your navel and back inside your pelvis. Imagine a glowing ball of light there. Flow attention down your legs and imagine growing roots from your feet, deep into the earth. 2) Notice when you shrink, and practice being big. Why it matters: It’s your responsibility to attract and hold your audience’s attention. When you “shrink”, they have to actually exert effort to pay attention and you don’t seem very powerful. It’s draining for them. You might shrink when you’re caught off guard by harsh words, or when you stand up in front of a room of people. When you’re “big”, you effortlessly hold people’s attention. You feel at ease and look more radiant. How to do it: Notice what it feels like when you shrink. You might feel constricted, rushed, or physically get smaller. Imagine taking up all the space within an arm’s reach of your body. Visualize yourself in a bubble with its edge just beyond the reach of your fingertips. Feel yourself expanding to inhabit every inch of it. Why it matters: You need frequent confirmation that what you’re doing makes a difference, or you’ll stop doing it. Recognizing small changes is essential to you continuing to increase your presence. Practice being grounded, being big, and noticing shifts every day. If you’re looking for personalized feedback, book a discounted one-on-one call using promo code FABFEM. The next time you walk into an important interaction, take a deep breath, be in your body, and remember that your presence is always more effective than being a perfectly polished speaker. 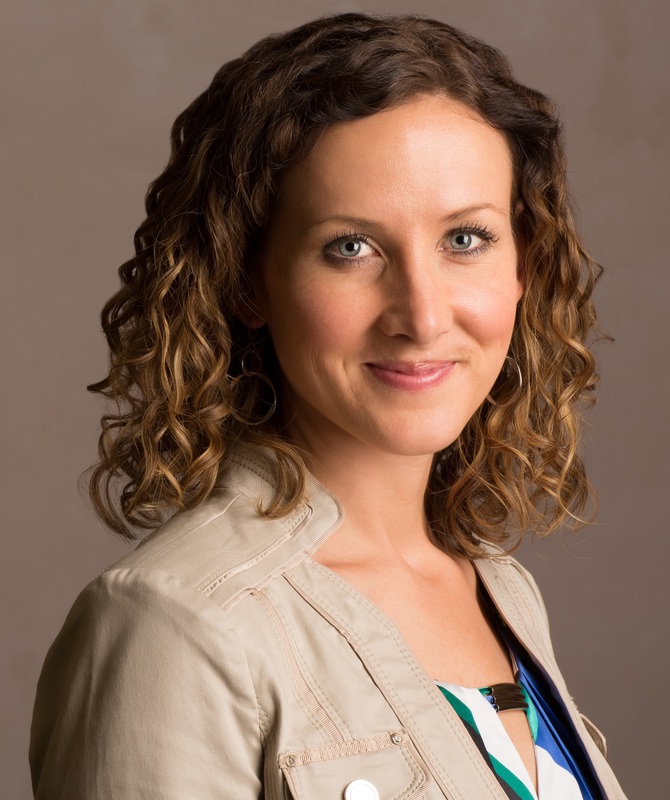 Cassie Nevitt is the personal presence expert for women who have training and expertise in their field, but struggle to speak confidently in or about their work. 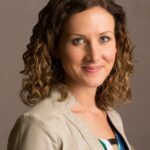 When it comes to helping clients develop the presence to speak at the front of the room, ace an interview, or be seen and heard in the boardroom, she’s the industry expert. Cassie has more than 5 years of experience teaching The Art of Feminine Presence and 10 years teaching strength and confidence through movement. She teaches classes and programs locally in San Diego, and is available for private coaching in-person and over Skype.